Digital Gameworks and HPS Simulations have released DEFCON-2, a turn based strategy mini game about the Cuban missile crisis of 1962. 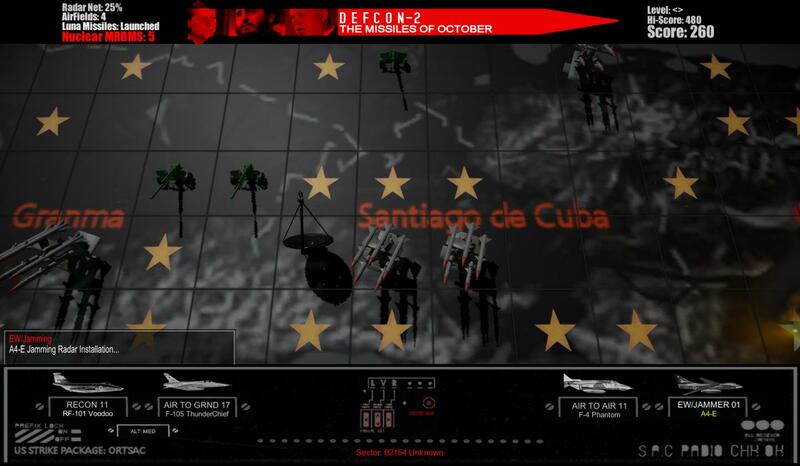 Following a game design philosophy based in simplicity, clever use of abstraction and replayability, this mini game has only one single player scenario in which the enemy units (airbases, SAM batteries, AAA, radar installations, and Nuclear MRBM) have variable starting points. Replayability is surprisingly high given the relatively small size of Cuba, I suppose that the enormous amount of combinations is responsible for that. So, in theory no two games are to be equal. But more about that later. 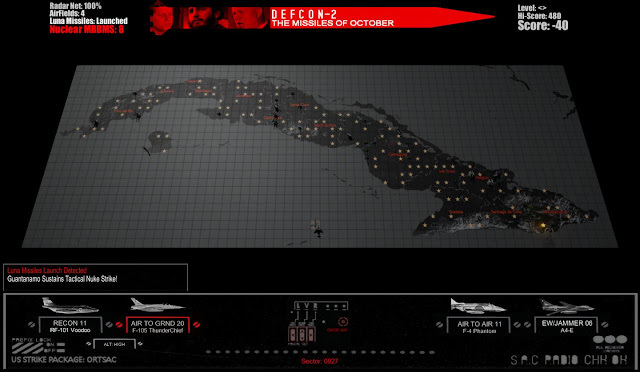 The theater of operations. 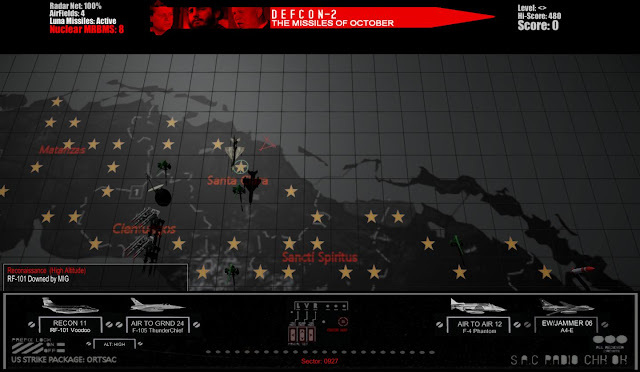 Each star is a possible enemy location and you should use recon sorties to find out what is in those locations. The game plays in a very simple way. You choose a location in the map and depending what is there you can choose what to do. Enemy unknown (location with stars on it)? You can fly a recon unit to find out what is there. Or a flight of Thunderchiefs for a ground-pounding mission. SAM battery? You can send a ground-strike mission on it. You can even jam enemy radars with your EW aircraft so the effectiveness of nearby SAM batteries is reduced (yes, you can lose aircraft to those SAMs). The enemy reacts to your actions. In this case, a RF-101 (flight?) was destroyed by enemy MIG(s?). Units are abstracted, so it is pointless to try to figure out what is the airframe count for that action (one or multiple aircraft). What you should do in those cases is to send an air-to-air mission to take care of that/those pesky MIG(s). The sequential assignment of actions feels a bit off for my liking. I can't send a ground strike mission with escorts. Instead, I have to send the ground-strike mission and -if enemy aircraft show up- send an air to air mission to deal with the interceptors. I suppose that the combat results table has some sort of abstraction to account for this limitation. But I can't find any reference about that in the manual. Nonetheless, I keep coming back to it, because it is easy to forget about the limitations of the game when the challenges are new every time I fire it up. There are particular combos that are an absolute pleasure to deal with, like a SAM-AAA-guarded nuke site. These tend to drain your assets dry like the glass of booze of a drunkard. And then there is the grand picture of things. Should I go for air supremacy first and then take care of the nukes? Should I risk all my air assets and just go straight to the jugular (i.e. hunt down the nukes without caring for losses)? The jamming of that radar site will allow me to send aircraft to strike these enemy SAMs with a lower risk of being shot down. 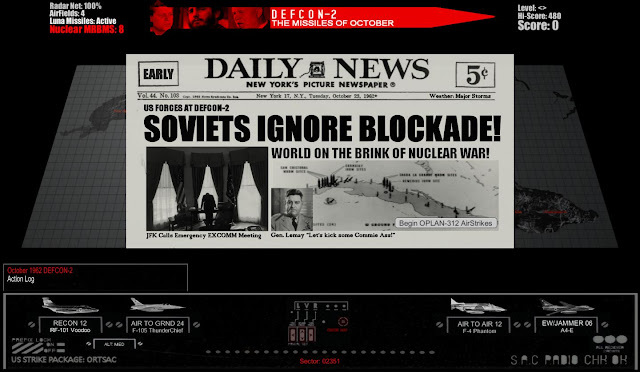 The objective of the game is to destroy the Nuclear Ballistic Missiles before the enemy decides to strike the US mainland. In this case, one gone and seven more to go. Game over. Good luck next time! This game's strong suit is the clear, barebones operational/grand tactical presentation of variations of a historical setting. 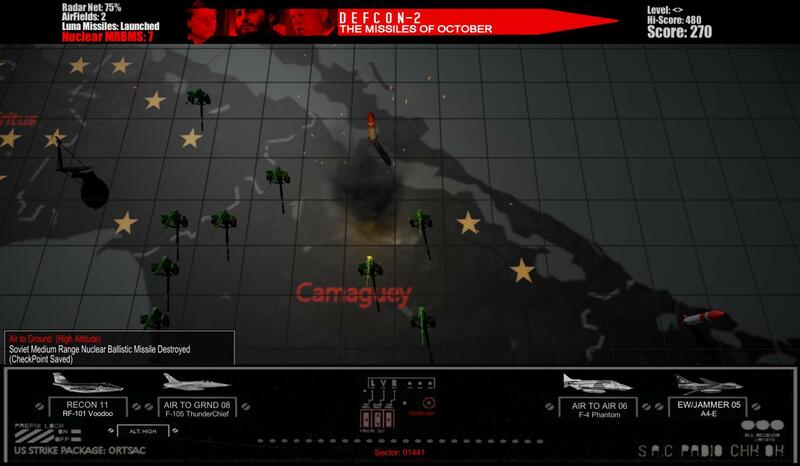 If you are longing for a full air war over Cuba, with ATOs, OPORDs and orders of battle, this is not your game. But if you are looking into a simple game which is easy to understand and play, surprisingly challenging plus not too offensive of your simulation sensitivities, this may be it. More about this game coming. Interesting. 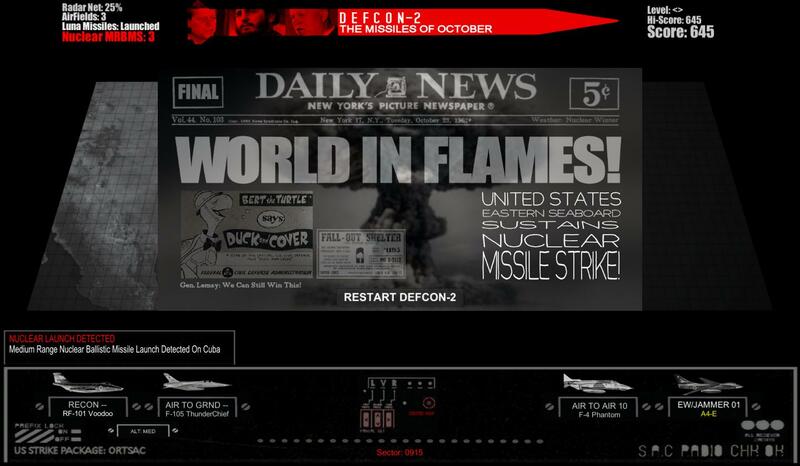 I will wait for a gameplay video, but that might be hard to find because of the other game called Defcon.